Corner of Main St. and Passaic St. 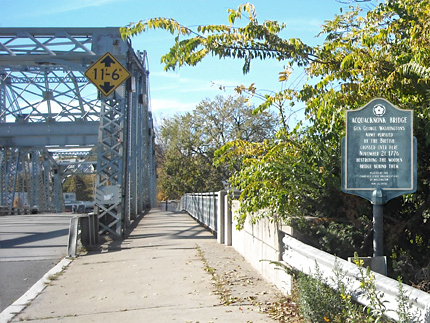 This marker, which stands yards from the modern bridge here, commemorates the site. A small park along the river, next to the bridge, is called Liberty Crossing Park in honor of the November 21, 1776 crossing. It was dedicated October 20, 2007. Note that the Passaic page of this website has additional listings related to this crossing. 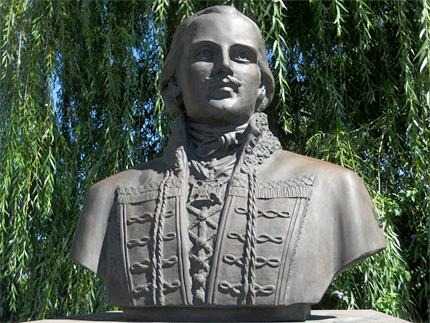 Main Ave. near Locust St.
General Casimir Pulaski was born on March 6, 1745 in Warsaw, Poland. In 1777, he came to America to fight on the American side in the Revolutionary War. 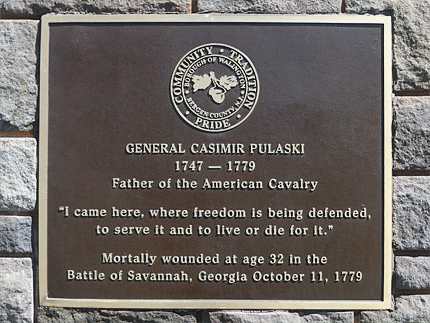 He commanded a group of cavalry which was formed in 1778  known as Pulaski's Legion, and he is remembered as the "Father of American Cavalry." He died on October 11, 1779, from wounds suffered at the Battle of Savannah, Georgia. 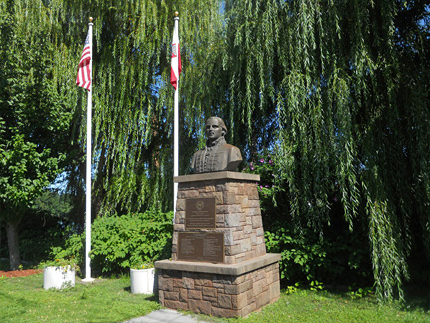 There are three other monuments honoring General Pulaski in New Jersey: one in Garfield, one in Paterson, and one in Pennsauken. In addition to these, there is a sidewalk plaque in North Arlington honoring Pulaski, and the Pulaski Skyway is named for him. 1. ^ For more information and accompanying source notes about the landing at Lower Closter Landing see the Alpine page of this website. For a detailed description of the events connected with Fort Lee and the retreat, see the Fort Lee page. Available to be read at Google Books here. ▸ See the Post Ford entry on the Garfield page of this website for more information and accompanying source notes. 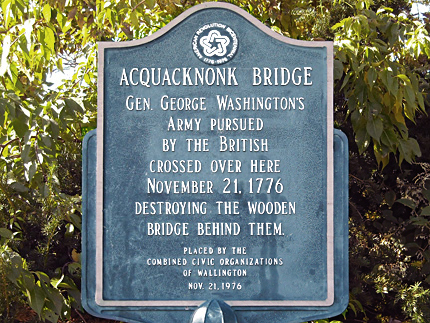 • In his letter to the President of Congress marked "Head-Quarters, Trenton, 3 December, 1776," Washington wrote, "I arrived here myself yesterday morning, with the main body of the army..."
• In his letter to the President of Congress marked "Mr. Berkeley's Summer-Seat, 8 December, 1776," Washington wrote, "The retreat was accordingly made, and since to this [Pennsylvania] side of the river." ▸ "Mr. Berkeley's Summer-Seat" refers to the home of Thomas Barclay in Morrisville, PA, which Washington used as his headquarters from December 8-14, 1776. The house still stands and is open to the public for tours. For more information, see the Historic Summerseat website. • A gallery of photos from the 2007 dedication ceremony can be seen on the Borough of Wallington NJ website here. 6. ^ Sculptor credit and dedication date information from bottom plaque on the front of the monument. 8. ^ The other five people granted Honorary United States Citizenship are: Winston Churchill, Raoul Wallenberg, William and Hannah Callowhill Penn, and Mother Theresa. Only Churchill and Mother Theresa received the Honorary Citizenship while they were alive. All others received it posthumously. ▸ Note that Pulaski and de Gálvez are not listed in this document, because it was published in 2008, before either had been granted the honor.